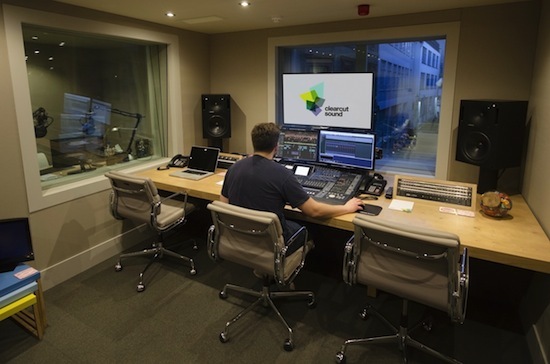 Our friends at HHB Scrub have been busy supplying a full Dante networking solution to Clearcut Sound Studios’ audio post production facilities. The recent upgrade to Clearcut Sound Studios included the installation of a Dante audio networking system, providing real-time audio routing between four mix rooms and studio computers. Dante, an IP based audio transmission format, is capable of supporting 100s of digital audio channels at resolutions up to 24-bit uncompressed, and sample rates up to 96kHz. Scrub also supplied Clearcut with HP computers with Yamaha AIC128-D Dante Accelerator PCI Express audio interface cards, and Yamaha MY-16-AUD Dante expansion cards fitted to the DM2000 mixing consoles. All of the Dante interfaces are connected to a Gigabit Ethernet switch with standard network cabling, creating a network that allows almost unlimited audio routing between the four studio systems. The upgrade also included the Waves Platinum plug-in bundle. The upgrades Scrub provided give us ultra-fast speed and flexibility and a cutting edge networking architecture that we can rely on. This was part of a major upgrade to the studio as a whole, which results in more spacious mixing environments with the fastest, state-of-the-art digital audio mixing infrastructure available. Our clients have noted the benefits of the new facilities and we are very pleased with the support and services that Scrub provided throughout the process. It is interesting to see another audio over IP network solution. We should expect to see more and more of these and lets hope we can adopt a standard so that all the different brands can talk to each other and enable us to run different brands together on one system.